Gray skies and low tides again. How moody the ocean is. 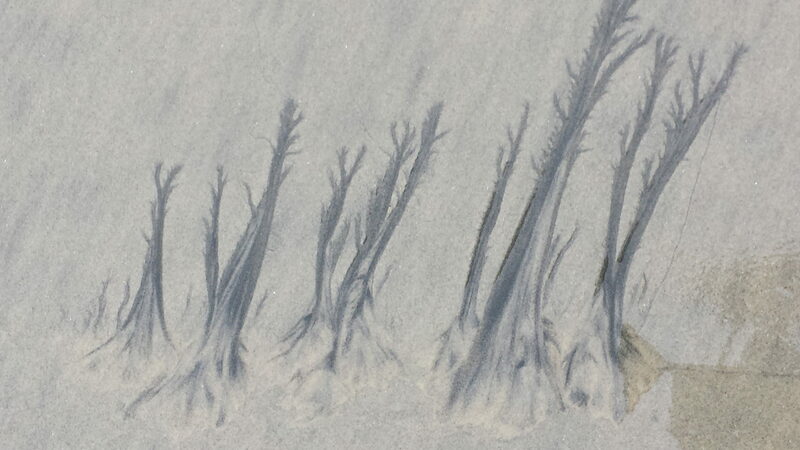 So I wonder, what combination of pebbles and tiny shells and tiny indentations made the recession of the waves create this landscape of leafless trees? Here is an enormous mass of water painting an expanse of burnt out forest. Or so it seems. We collected some beach pebbles today. They erode away from the cliffs, having been captured there eons ago. I gathered a green one, a purple one, an orange one, a gold one, a red one, a white one, and a black one with white speckles. I shall arrange them on a ledge at the edge of the patio and see what becomes of them. I would like to be collected up like a pebble and rearranged. We all need a lot of rearranging, don’t you think?